Dear Readers, I was flabbergasted when I found these flowers last week. 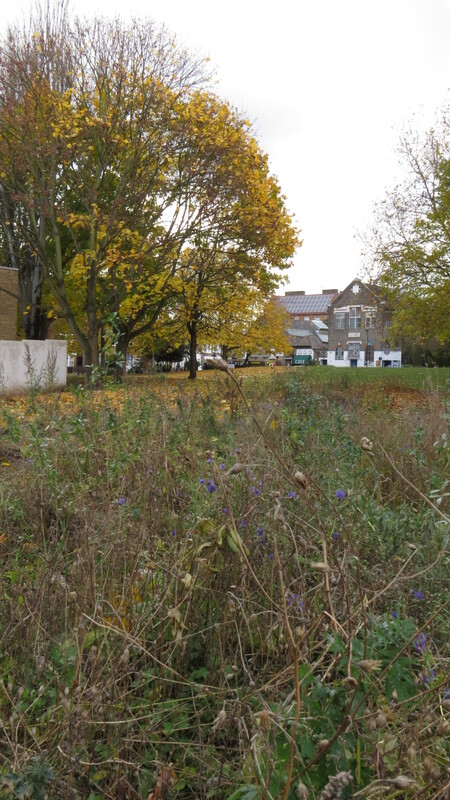 I was in Whittington Park, just off Holloway Road, and decided to take a detour past an area which has been planted up to encourage sparrows. From a distance, I could see a faint blue glow amongst the dead and dying foliage. 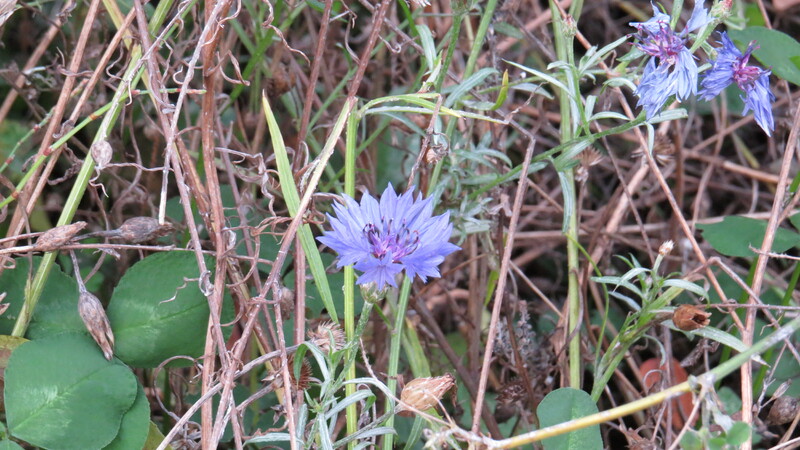 When I got close, I could see that there were several cornflowers in full bloom. What a treat! They are normally summer flowers, so why they are bursting forth in November I have no idea. How exquisite they are. I had never really looked at the flowers properly before, but when I did, I noticed that they are actually comprised of a ring of small bellflowers. The colour is as blue as any flower gets. The cornflower is an ancient introduction and is traditionally a plant of arable ground, introduced in the Iron Age from mainland Europe. However, improved seed cleaning and widespread use of herbicides meant that this plant has declined from 263 sites to just 3 in the past fifty years. This has also been the fate of many grain-field ‘weeds’, such as poppy, scentless mayweed, corncockle and field marigold. It’s true that many organisations are now trying to reintroduce these plants by using seed mixes, but Clive Stace, in his book ‘Alien Plants’, points out that originally these plants would have produced a patchwork effect in a field, with some areas blue, some white, some red and some yellow according to the microconditions of the habitat and the way that the field was managed. The best that we seem able to create these days is a mix of plants where no one kind predominates, probably because we either meddle too much, or because we leave too well alone. The effects that used to happen as a byproduct of the way that we managed land are now lost to us. This is not to say, however, that cornflower was not something of a pest in the cornfields of old. When grain was harvested by sickle the tough stems were said to blunt the blade, hence one of the plant’s many alternative names, ‘Hurt-sickle’. 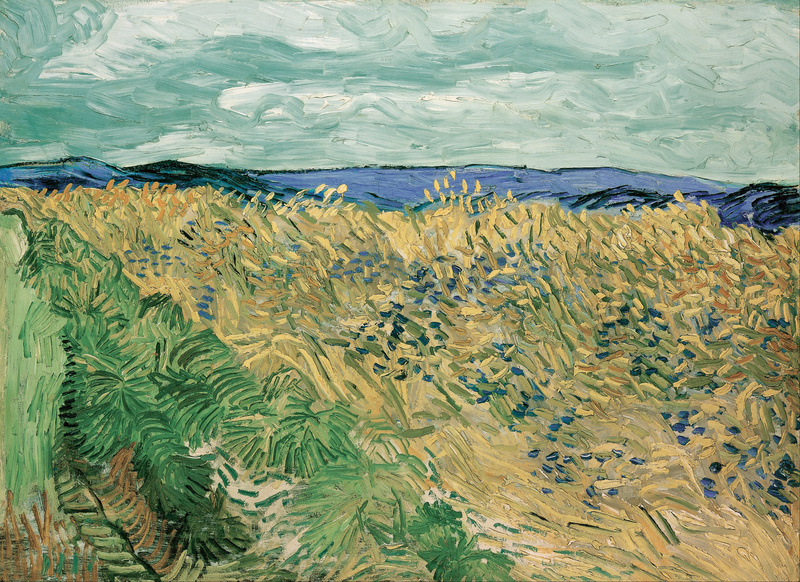 Even the poet John Clare wrote of the cornflower as ‘troubling the cornfields with their destroying beauty’. It was clear that, as Mabey says, it would soon ‘get its comeuppance’. In today’s search for ever higher productivity, there seems to be no place for a plant which interferes with return on investment. Cornflowers are members of the daisy family (Asteraceae) and are annuals. The seed has a long life in the seedbank, and Mabey reports how some seeds which had been buried in the 1930’s germinated in the 1990’s. It has a wide variety of vernacular names, which is characteristic of a plant that has lived with us for a long time: here are just a few of the English language names collected by Sue Eland on her Plant Lives website. Another alternative name for the plant is ‘Bachelor’s Button’ – it was said that if a flower placed in a button hole survived, the young man wearing it would marry his current sweetheart. It’s also said that bringing the plant indoors will make bread turn mouldy. In ‘Flora Britannica’, Richard Mabey tells of how, on the 50th Anniversary of VE Day, world leaders laid posies of their national flowers around a large globe. Posies of cornflowers were laid by representatives from France, Germany, Estonia, Belarus and Czechia, an indication of how well-loved this ‘weed’ is across its whole range. 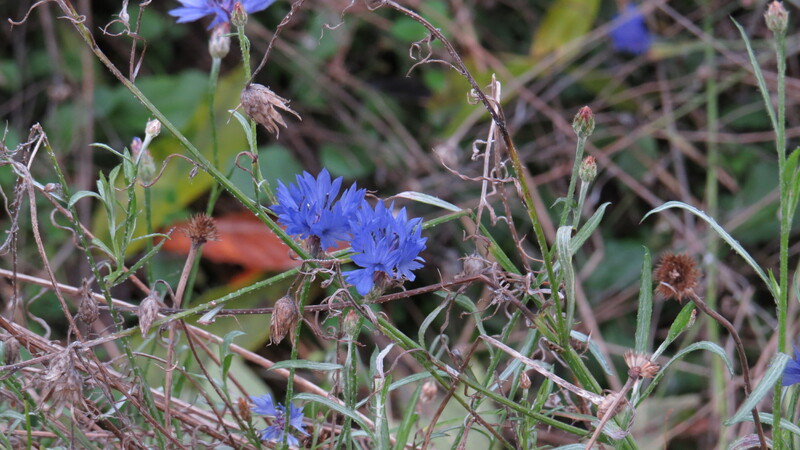 Not surprisingly, the blue colour of the cornflower attracted many who wanted to extract the pigment. It can be used as a dye for linen, as ink and as watercolour paint (by pounding the centre of the flowers in a mortar). It has apparently also been used to colour perfume and, surprisingly, wine. The flowers are used in potpourri for their colour, and very pretty they are too. Sue Eland mentions that cornflowers were found in Tutankhamun’s tomb, and that they retained most of their colour even though they were interred over 3000 years ago. It is no wonder that a plant so vivid should have a variety of medicinal uses. It has a long history in the treatment of tired and sore eyes: cornflower was considered to be the tincture of choice for blue eyes, while greater plantain was better for brown eyes. It was considered efficacious against the poison of scorpions, and the juice was said by Culpeper to ‘quickly solder up the lips’ of a wound. It was also considered to be good for mouth ulcers and sores. Incidentally, the genus name of the plant, Centaurea, comes from the belief that the centaur Chiron taught mankind the benefit of healing wildflowers (when he wasn’t teaching Achilles, Ajax, Peleus, Hercules and practically every other hero of the classical world). Having ascertained that cornflowers have medicinal uses, my mind naturally turned to that most perennial of questions – can you eat it? And I soon found the most intriguing recipe for Calendula and Cornflower Fudge, and if anyone makes any I would love to hear how it turns out – it certainly looks scrumptious. And how about a cornflower cocktail to go with it? Sounds like a perfect afternoon to me. It will come as no surprise to learn that cornflowers have featured in the work of many artists, what with that spectacular colour and all. 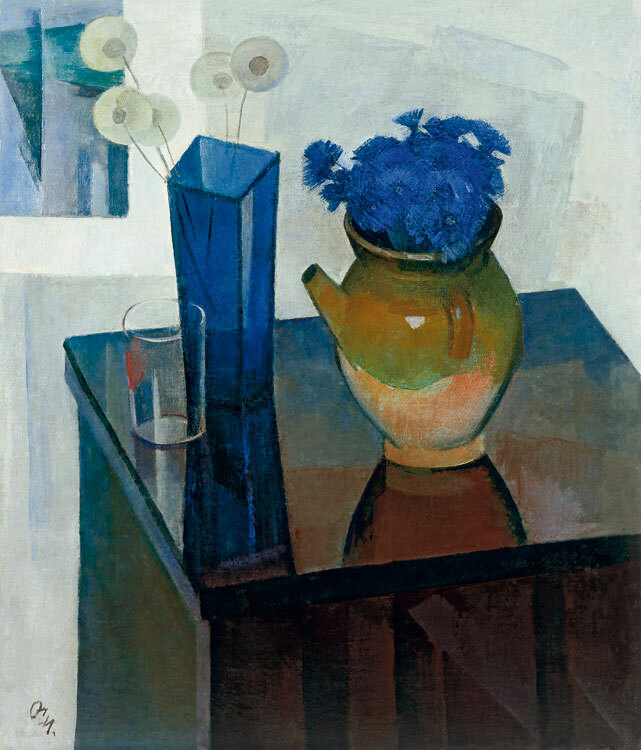 So, here is ‘Cornflowers’ by Sergei Ivanovich Osipov, a rather splendid still life painted in 1976. 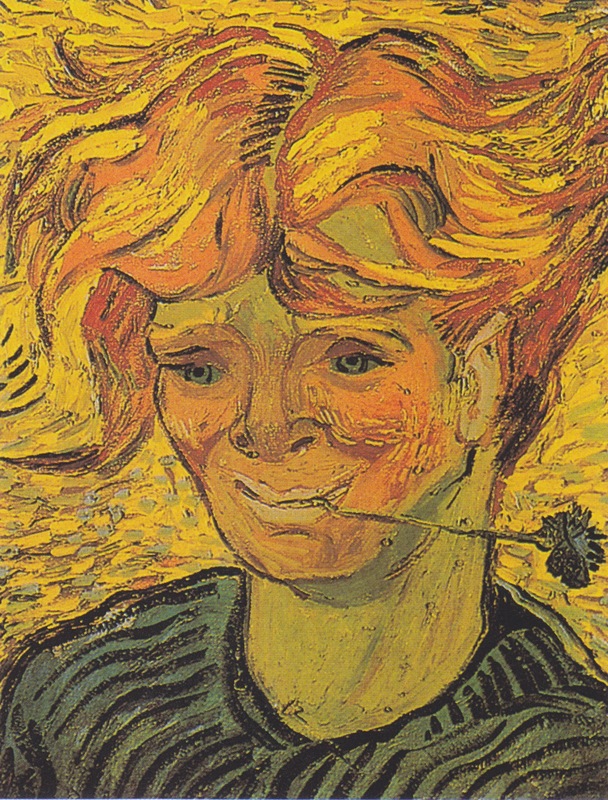 But, to return to young men and cornflowers, here is Van Gogh’s ‘Portrait of a Young Man with Cornflower’. I love the mischievousness of this, and the way that the young man’s eyes echo the colour of the flower. But I would like to end with a portrait by the Russian artist Alexey Venetsianov. I knew nothing about him prior to finding this painting, but was intrigued to learn that while painting peasants and people of ‘the lower orders’ was something that artists often did when they were looking for a romanic and picturesque subject, Venetsianov went out of his way to teach people from poor backgrounds to paint. When he was given the title of ‘Court Painter’ by Tsar Nicholas I, Venetsianov used the salary that he obtained to ensure that tuition at his art school was practically free. He even had some students who were serfs, which was unheard of at the time, when such people were considered as little more than beasts of burden. 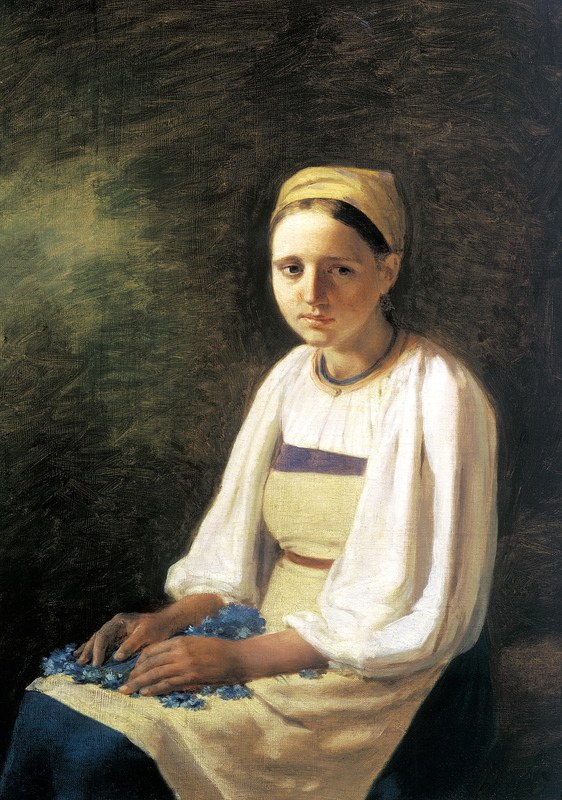 So, here is his painting ‘Peasant Girl with Cornflowers’, in honour of his generous spirit and his good heart. This entry was posted in London Plants on November 23, 2016 by Bug Woman. Lovely post of a lovely flower! Another wonderful post, thank you for posting. Seems pretty late for this flower to be out … would be little chance of it flowering up here in Cumbria where there has been a fair amount of snow the last week! Hi Harriet, yes I was very surprised too. We haven’t seen a single snowflake so far here in London, so I guess the cornflowers seized their chance for a modest spot of flowering. what a treasure trove of delights. thank you. it reminds me of happy times in Egypt when the museum tour guide spoke of “lapis lazuli eyes” . Lovely, Rose, yes they remind me of lapis lazuli too…. Another wonderful post, especially with the accompanying art works. Quite often many of the plants and flowers you talk about jar memories of having grown up with them. Can the exquisite cornflower, which I’m sure was one of my favorite sightings, have made it all the way to upstate New York? Hi Katya, yes indeed! According to Wikipedia (that source of all information 🙂 ) it’s naturalised throughout North America. I imagine it arrived with the grain that the first European settlers would have brought with them, in much the same way as it made the crossing from mainland Europe to the UK…. I love it that you give us so much to look at and think about – bring on that book! 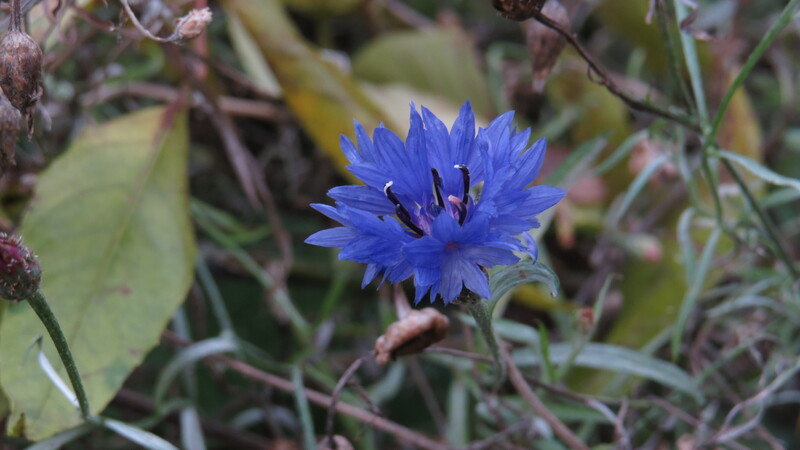 And the way the photos bring out the blue of the cornflower is wonderful. 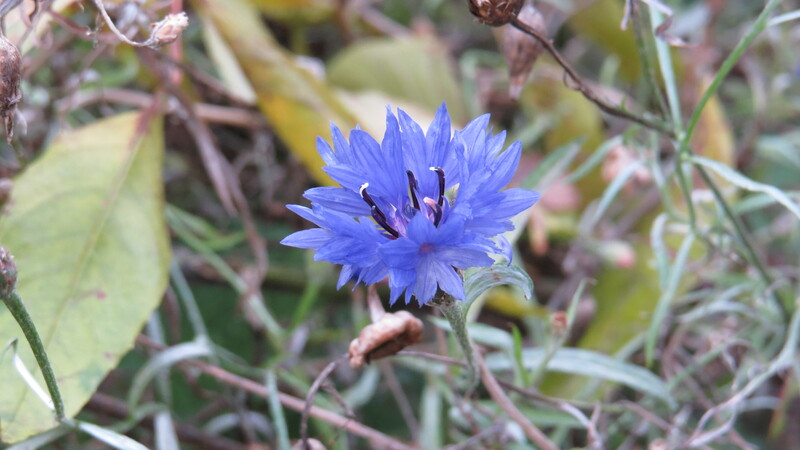 One of my favourite flowers, the blue colouring rivalled only by the Chicory flower. The last painting is lovely, you can see the staining on her hands from the flowers. 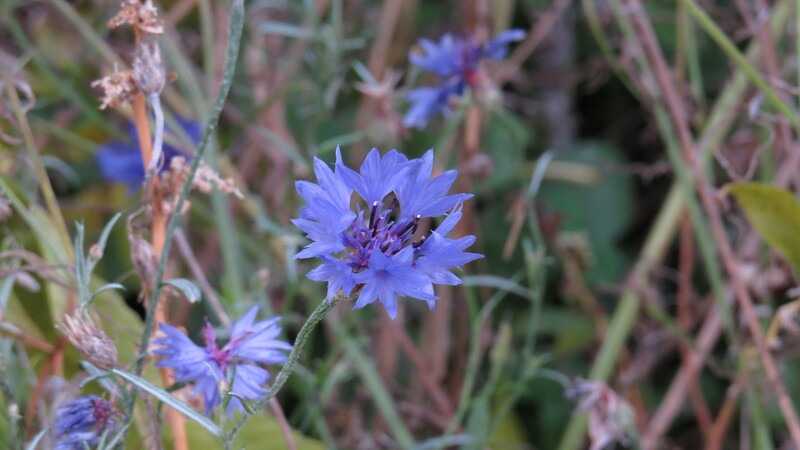 Cornflowers are beautiful, but I’ve learned many new things about them today, thank you. Glad you enjoyed it, Andrea!